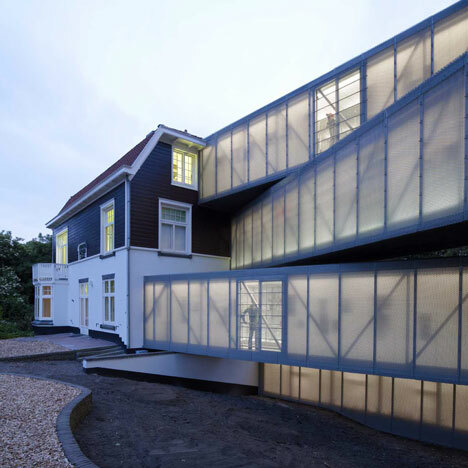 Dutch architects Bureau SLA have connected two houses in Leerdam, Holland, with four overlapping bridges to create a continuous gallery. The National Glass Museum’s steel-frame bridges are clad in polycarbonate wrapped in aluminium mesh. 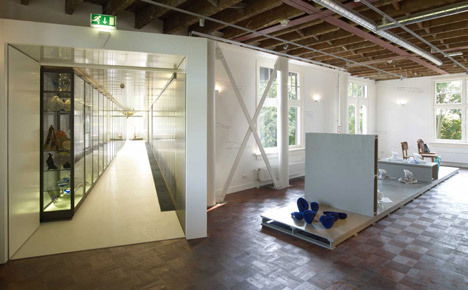 Exhibition spaces are spread across both existing buildings and the bridges with 9000 objects on display in glass cabinets by Dutch designer Piet Hein Eek. 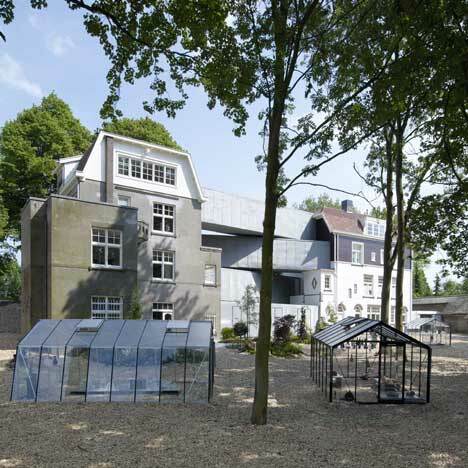 Both buildings have been refurbished with one housing a restaurant and the other a library that doubles as staff offices. 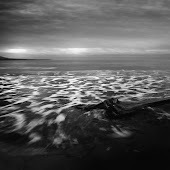 All photographs are taken by Jeroen Musch. 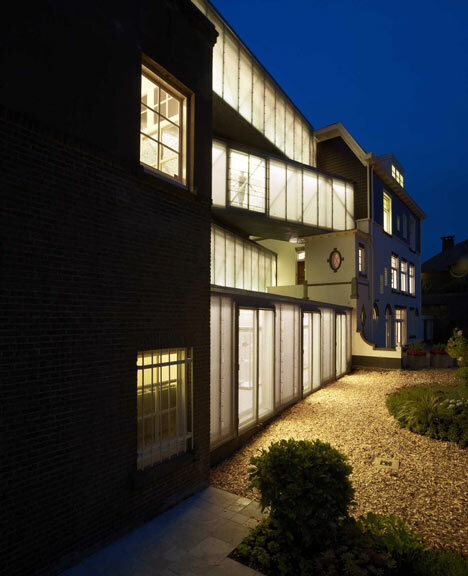 Once the villa on Lingedijk 30 had been acquired, bureau SLA were commissioned to turn the two buildings into a home for the National Glass Museum. 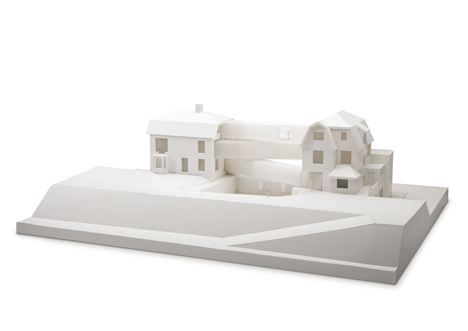 It was suggested to turn Cochius’ former residence into an exhibition area and to use the second villa as offices, storage facilities and a cafeteria. Whilst this fulfilled functional requirements, it seemed like a missed opportunity to us at bureau SLA, as the new situation would appear to be not very different from the old one. The museum would have more space, indeed, but this would not be visible from the outside. 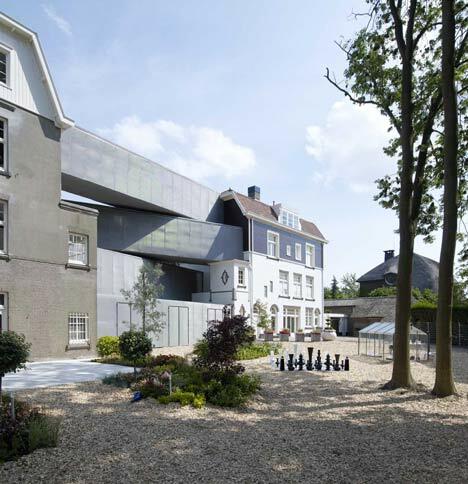 So what would happen if we made both buildings fully accessible to the public? 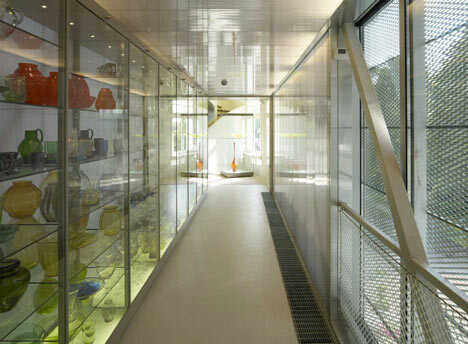 The museum’s employees could eat in the restaurant, the visitors could have full access to the collection of glass, including that in storage, and the administrative staff could work in the library. Furthermore, the exhibition rooms could be far more spacious. 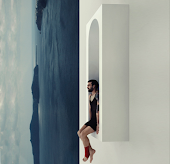 Instead of the small rooms of the existing villas, in which visitors need to climb up and down stairs all the time, circulation and exhibition spaces could to be much more generous. The four pedestrian bridges that bureau SLA designed draws everything together in an elegant manner. Visitors can idle through extensive rooms; only one lift is needed and an enormous amount of space is gained. 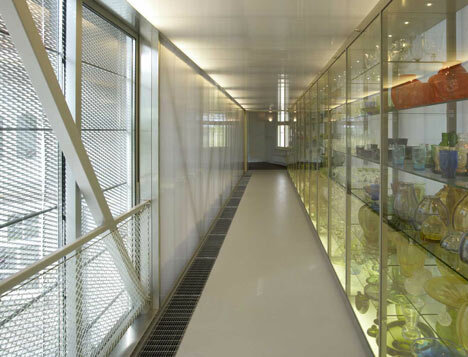 The bridges serve as storage space in which all the museum’s objects are on display, in cases specifically designed for the museum by Piet Hein Eek. In the historical villas not much more needed to be done; they were elegant by themselves. Repairs were carried out where needed, with some later additions removed. 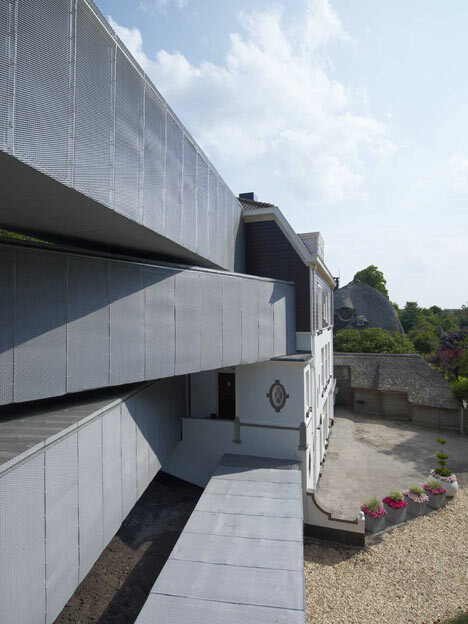 The bridges were constructed from several layers of polycarbonate panels and covered by a translucent skin of grey, powder-coated, aluminium mesh. 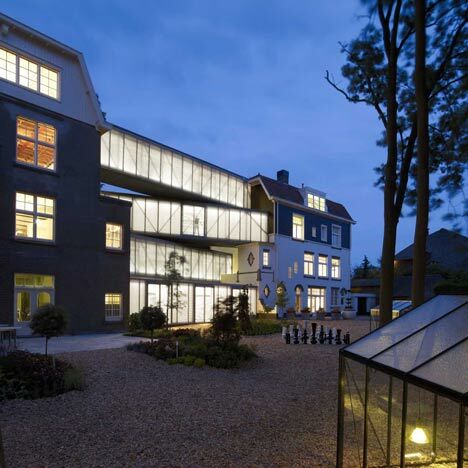 During the day they contrast sharply with the refined old villas, whereas at night they glow in reflection of the 9000 glass objects inside them.